Nurses are generally known to wear white but sometimes it’s good to switch it up. These black clogs are perfect for nurses who either want a change or just prefer to wear black. We have, however, noticed that there is some divide in what type of footwear nurses are looking for when searching for “clogs”. 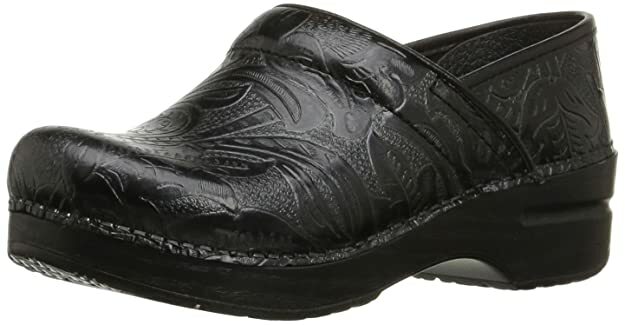 Some are looking for traditional clogs made of leather (or similar material) for a professional look, while others are looking for more relaxed, black rubber clogs for comfort while on the ward. This is why we’ve separated the list in two so you can just click your preference below, and you’ll be taken to the appropriate section. We sincerely hope we have something here that can make you happy! The main image of some of these shoes may not be black but the option (and pictures) is there on the product page. Dankso is a brand that is known to design and manufacture high quality, durable shoes for the orthopedic community. This style is one of their flagship ones because of the long list of features and benefits packed into a stylish shoe. For one, it provides firm foot and arch support thanks to the contoured midsole. It also has shock absorption similar to many sneakers and the instep collar is well padded. Break in time is around 3 to 4 days but after that, you’ll want to wear these shoes every day because of how comfortable they are. Furthermore, these clogs feature high-level slip resistance that is effective even in environments where excess oils and fats are present. These clogs carry pretty much the same features as the one listed above, but in a slightly different package. The designs on the outside add a bit of character which may be a plus for nurses who like to spruce up their work outfits a bit. This comfortable slip-on clog, made of faux leather, is a sturdy and well made shoe that goes on easy but hugs and hold your feet very well. The adjustable buckle also allows you to get a tighter or looser fit if you desire and unlike the Dansko clogs listed above, these have a fairly low heel height at only about 0.75 inches. Many customers have also lauded the short break in time, claiming to have put them on and feel comfortable almost immediately. Did you know that Skechers makes clogs as well? In fact, they’ve actually made several that are perfect for nurses. This particular model is made with breathable leather to keep your feet health and dry, necessary for those long days in the hospital or wherever you carry out your duties. The outsole (bottom) is made of slip resistant rubber which provides superior tractions when dealing with wet or slippery floors. The insole and midsole also work in unision to soften your steps and reduce shock to your joints, providing all day comforts while on the job. Damiani is an Italian shoemaker that create excellent, handmade shoes that are extremely durable, fashionable and affordable. These particular clogs feature a cushioned footbed that provides comfort and shock absorption while walking. Furthermore, the perforated leather uppers give you added ventilation which helps to keep your feet cool and dry. It is also surprisingly affordable, retailing at most places for under $30 per pair. These comfy nursing clogs are made with EVA foam, which is a rubber like material that is extremely durable and provides excellent shock absorption when walking. They’re also lightweight and are available in a wide range of colors. Crocs is a brand that has a stranglehold on the market for rubber clogs. They have this overwhelming market share because they consistently put out well built clogs that are not only comfortable, but last a long time as well. The Classic Clog is one of their bestsellers because it epitomizes simplicity, functionality, durability and comfort – the things that most nurses look for in a clog that they will be wearing for over 10 hours per day. This is an alternate version of the Classic Clog we just spoke about. The difference with this one, is that the inside is lined with soft, fuzzy polyester for extra comfort. It could also come in handy during those winter months to help keep your toes warm, without sacrificing comfort. Designed with the working woman in mind, these black clogs are perfect for nurses who aren’t drawn to the casual look of the classic Crocs clogs. This one almost looks like a shoe but has comfort that can only be found in slippers due to Croc’s proprietary Croslite material and roomy design. It is also slip resistant and provides enhanced arch support for those who may need it. These work clogs created by Jolly were built for all types of weather, and any environment. Made from CFC free Polyurethane Foam, they are light, flexible and comfortable, but almost indestructible. Unaffected by moisture, oils, fats, corrosives, dust, kitchen garbage, etc.